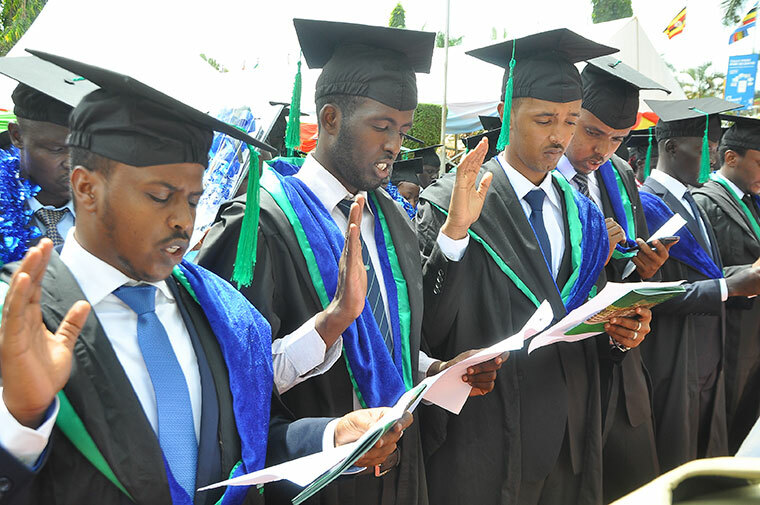 KAMPALA- A total of 3700 students will graduate from Kampala International University November 19 to join thousands of others in the job market. According to the acting Deputy Vice Chancellor for Academic Affairs, Prof George Nasinyama, six students will be awarded doctorate degrees (PhDs), and 36 students will graduate with first-class degrees in different disciplines. He explained that the ceremony, which will take place in her main campus at Kansanga, Ggaba Road, Kampala, is scheduled for 7:00 am East African time. “We are pleased to have this significant number of graduands, one of the biggest in our history for a single graduation session. This is clear evidence of the growing number of students that are attracted to KIU’s mix of quality of programmes, facilities, and quality academic staff,” said Prof Nasinyama. He revealed that this would be the 19th graduation ceremony for the University since its inception in 2001 and received its university charter in 2009. Prof Nasinyama said KIU’s main campus has four constituent colleges and four schools; College of Education, Open and Distance Learning, College of Computing and Information Technology, College of Higher Degrees and Research, College of Professional and Extramural Studies, School of Law, School of Economics and Management, School of Engineering and Applied Sciences and School of Humanities. Since her establishment in 2001, KIU has so far graduated over 40,000 students and as such the institution has grown progressively with regards to the numbers of students, infrastructure, and facilities, to provide a world-class education to all her students. Last year a total of 2400 students graduated at various levels from certificate to PHD levels during the 18th graduation ceremony at the campus. The ceremony was graced by His Excellency President Yoweri Kaguta Museveni, the Chairman Board of Trustees of KIU, Al-haj Hassan Basajjabalaba, the Vice Chancellor, Dr. Mouhamad Mpezamihigo, the Deputy Vice-Chancellors, among other notable personalities, one of whom wasHer Excellency, Sedef Yavuzalp, Ambassador of Turkey to Uganda. World Bank figures show that more than 62 percent (4.5 million) of 7.2 million of Uganda’s youth are unemployed. Uganda National Household Survey 2012/13 says nearly 60 percent of Ugandans are below the age of 18. This means 20.4 million more youth will soon join the jobless market.